Sign up today this will change your life! 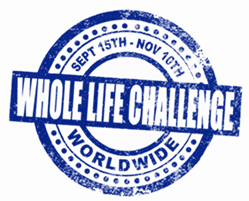 ...And in honor of tomorrow being the first day to register (remember, the actual Challenge Prelims start on Saturday, September 15 at High Voltage), I've put together what I'm calling 'The 7 Stages of the Whole Life Challenge'. This has come from talking to so many of you about the benefits of accountability and participation...be sure to tell me in comments what stage you're at! My mom, she's finally reached stage 5! Boom. We'll all be at Stage 7 on Saturday, November 10 (The Challenge Finals). 2- Pain & Guilt: I’m too (insert yours here: busy, tired, perfect) already to take this on. I can’t do a Challenge in September – I’ve only got 4 more weeks to get ready for it, there’s no way I can be ready in 4 weeks. 3- Anger & Bargaining: That's not how I already do things! Maybe I’ll watch others do the Challenge, and see if they get any results with all this ‘regular and moderate exercise, improved nutrition, stretching, and fish oils’ sensible approach. 4- Depression: ‘Everyone else is going to rock the challenge, but not me…there’s NO WAY I can do 8 weeks of this. I always (insert your crutch here), I can't go 8 weeks without it! Ok, I’ll register, but I doub’t I’ll do well. Everyone else is perfect…everyone but me. 6- Reconstruction: You’re DOING the Challenge (starting with the Prelims on Saturday, September 15 at High Voltage) AND…you’re actually living the goals and life that others ENVY. Your friends & family want to register and get in on the awesomeness (and they actually can! ).